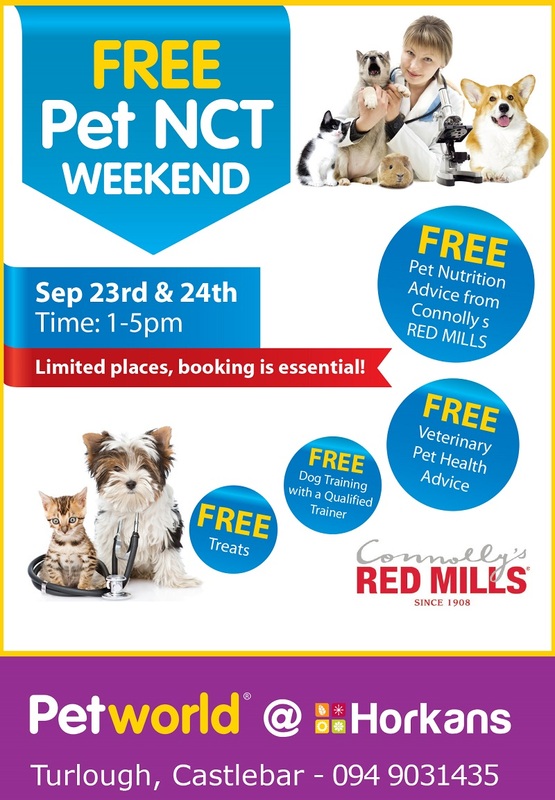 Petworld @ Horkans Castlebar are delighted to announce that our next Pet NCT Weekend will take place on Saturday 23rd and Sunday 24th September. Regular health check-ups are important for the long-term health and welfare of all our pets and routine examinations help us to take a pro-active role in preventive health care. Petworld's Pet NCTs take place twice a year and are the perfect opportunity to give your pet a FREE health check-up and catch any problems early before they get out of hand. At the Pet NCT Weekend there will be a carefully selected team of qualified experts available including a veterinarian who will give your pet a health check and offer advice on your pet's health. You will also have your pet weighed, receive nutritional advice from our nutritional adviser and dog training from a qualified trainer. Best of all, everything is 100% FREE! Places are limited so book early to avoid disappointment. Mayo man launched leprechaun into space!! Greetings from Deepest, Darkest Africa! Beat Stress in the Workplace Are you Ready for the Stress-Free Challenge? Crusaders and Castles of The Levant. Brand new Castlebar based Holistic and Celtic spirit magazine. Do Councillors Favour 100 ft Statue?